This message is circulating on social media. A viral message warning Malaysians of robbers dressed as officials from the “Department of Home Affairs” actually turns out to be an alert issued to South Africans. This is a copy of the Republic of South African Department of Home Affairs’ alert. It is also important to note that Malaysia has no Department of Home Affairs, instead there is Home Affairs Ministry. The Department had warned South Africans to be alert of a group of individuals visiting homes in South Africa, pretending to be officials from the Department. “They carry with them documents with letterheads purportedly from Home Affairs and claim to be confirming the validity of IDs for the upcoming elections,” said the statement. “These individuals are criminals who rob households once they gain entry. There is no such initiative from the Department,” it said. 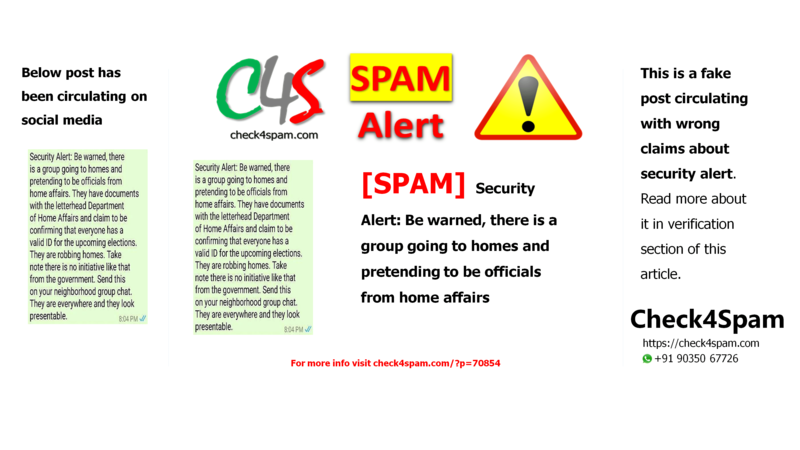 The Department informed that Home Affairs officials are clearly identifiable by name tags, and that household visits will be announced through official government channels. Many a times very old messages from different states or countries all of a sudden get viral. People start sharing them. At present this message is not valid. Its an old message making rounds and people are getting confused. Do not get carried away by such messages.